b) Wanted something cool to wear to the cabaret at Steamcon. 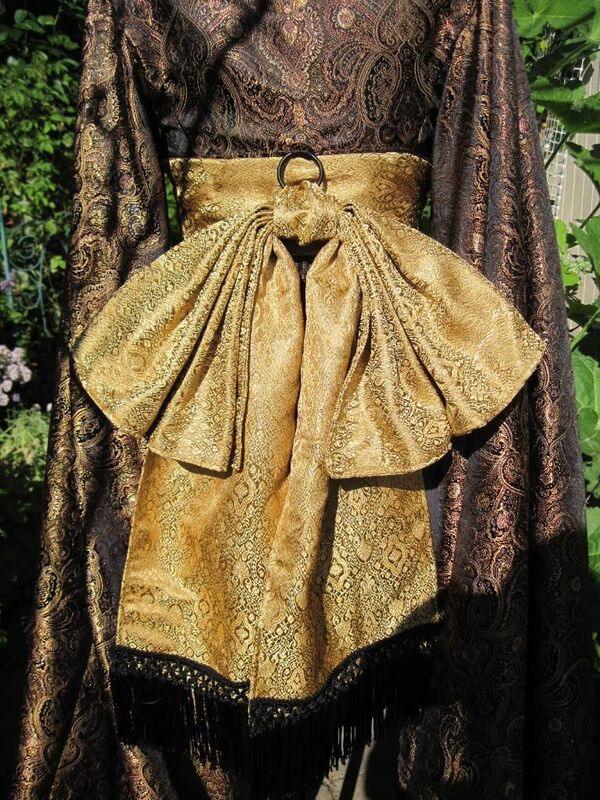 It is three layers: a striped gold and brown corset, a mandarin style cropped coat with immensely long sleeves, and a kinda-more-Japanese belt/sash. I have the ruffled pettipants I'm going to wear tucked under the corset in this picure. I'll wear it with over-the-knee stockings and Victorian boots. In the below pic, that dark line across the chest is a shadow. The jacket buttons up the side front. Since the fabric is all synthetics, I decided to burn the edges of the sleeves to 'hem' them, rather than sew. It made a very nice edge, and was remarkably easy. If you're curious, I just put a candle in a sturdy base, then held the fabric stretched between my hands and ran the edge across the flame. As long as I kept the fabric moving at a slow, steady speed, I had no problem with an even melt. And as for the fabric accidentally catching fire - it didn't seem to want to, even when I tested it. So I felt pretty secure - although I still did it over a non-carpeted floor. So now that this is done, I just have to sew the Victorian swimsuit (most of the fabric is cut), sew a tailcoat for Jon (who came to me just NOW with his request, GAH! 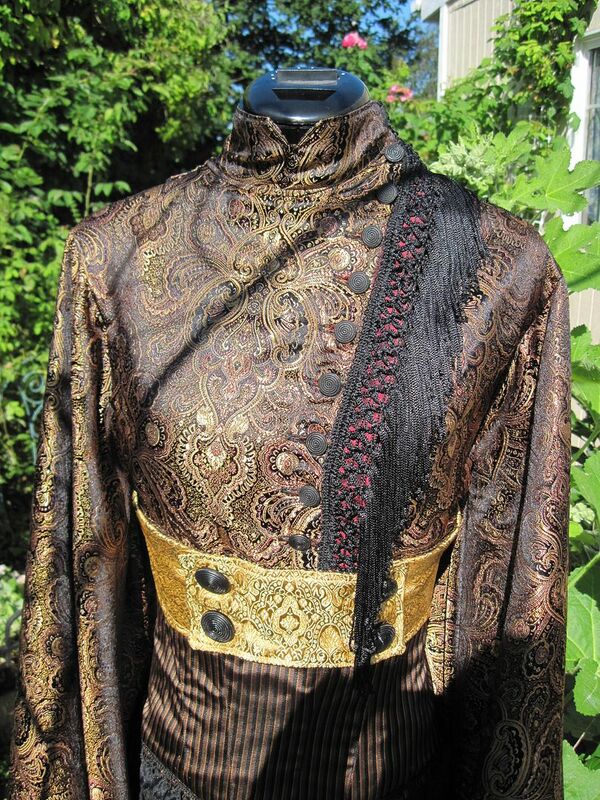 ), finish the Ottoman's beetlewing embroidered vest jacket (almost done with this) and make a turban. After that, it's just a few little details like polishing River's boots and I'll be ready for Steamcon. Hopefully, all of this will leave time to make the Femme!Ten outfit by Halloween as well. This means dyeing the suit fabric, finguring out the pattern and sewing it....and then I have to sew the coat. I do have all the fabrics and materials I need except for buttons. I thought about trying to finish Idris instead, but I don't have all the fabrics for that, and with nearly ALL the various fabrics needing to be dyed and distressed, I'm pretty sure I'd never finish in time. But directly after Halloween, it's on to Idris, because I am ridiculously excited to begin it! That's what you call quick and dirty? Where is a jaw dropping smilee when you need one? It is amazing! Just one question though, how do you not trip over the sleeves? Thanks! The sleeves aren't actually any more in the way than a train would be. They trail behind me, so as long as I don't try to back up, I'm fine! It looks really good! And especially from something just lying around ... I'm amazed. I do enjoy your updates on this blog, and thank you for putting it online to inspire and impress the rest of us. What pattern did you use? I really want to make something like this for a convention i'm going to. Sorry, but I didn't use a pattern. 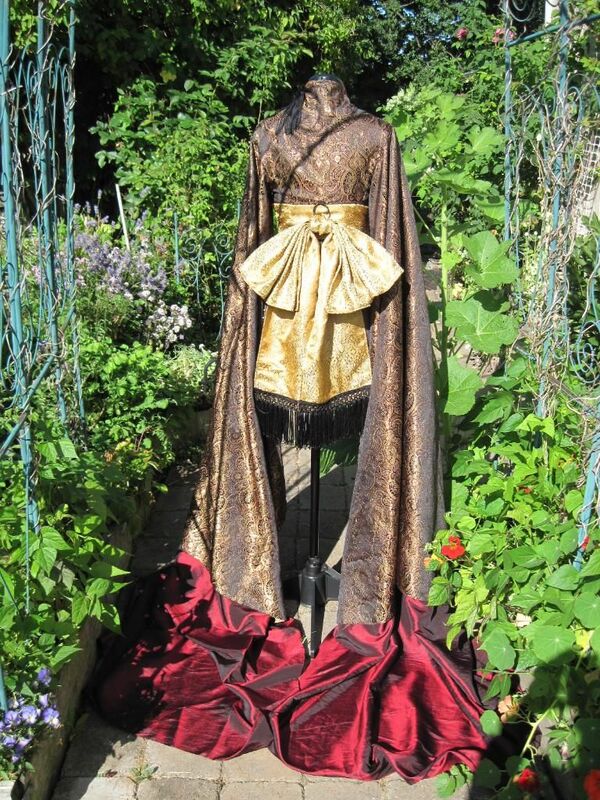 I make almost all my stuff my draping the fabric on the dressmaker's dummy. Hi. I'm new to your blog and totally blown away. 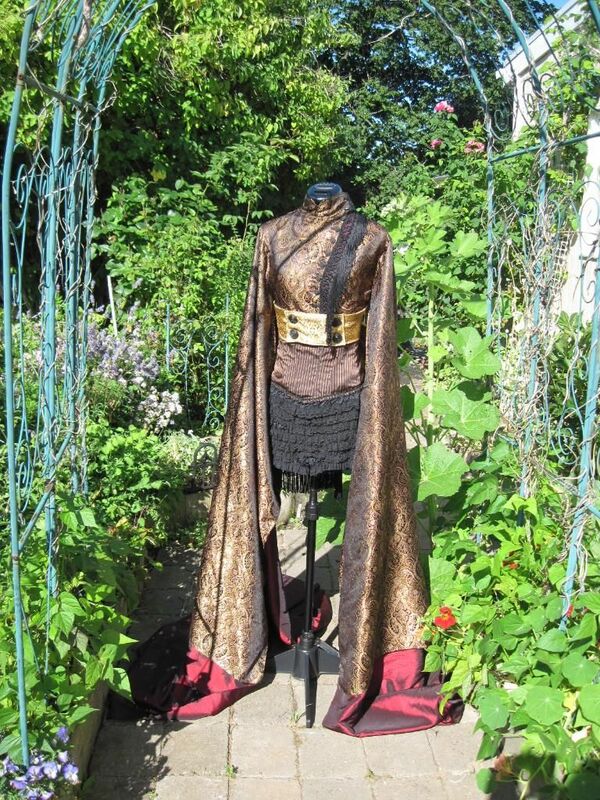 I'm so inspired to try to design a steampunk costume for myself. I've sewn and costumed for many years (mostly kids stuff of late - right now I have to do an owl for halloween) but no where near the level of intricacy and artistry or yours. I love that you show all the steps along the way. I remember back in the day when I was making my own Ballroom dancing gowns and there was no info on how to do it. So thanx! I'll be back to explore more. Hi, I'm also new to this site, but I have spent the past day looking at all you costumes. You are amazing! Did you use a particular pattern for the bodice and sleeves? Because I would love to make something like this for Halloween. Hi Eli, thanks so much! Generally, I make my own patterns, and that's what I did for this one. I just drape the fabric on my dressmaker's dummy and start cutting! But if you look for a pattern that has a mandarin collar, you should be able to find something quite similar. This dress is just so amazing!!! Would you mind if I had a dress made similar to this for a cosplay please? It wouldn't be identical, I promise!